When driving in the winter, make sure to have the lights on when the weather is less than ideal. This is important no matter what the weather is. If it is raining, sleeting, snowing, or even windy, you will want to have the headlights on. You will improve the visibility as you drive, as well as helping others to see where you are at on the road. Without the lights on, you will increase the chance of an accident occurring. If other drivers cannot see you, then they might rear end or crash into you. If you notice that the lights are dim, you may need to have the bulb replaced. Sometimes the lens will need to be cleaned so the light is able to illuminate the road better. Either case, make sure to bring your vehicle in so we can inspect the lights for you. While checking how bright they are, we can also check the alignment of them. They should be aimed properly so you can see the road ahead of you, as well as a little off to the side. This helps you to be aware of anything that might be in the ditch. Having them aimed correctly will also reduce the chance of the lights blinding oncoming traffic. 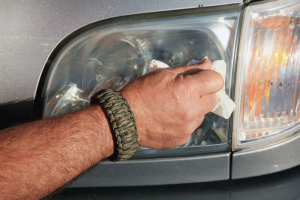 A general rule of thumb is if you have to use the windshield wipers, then make sure to have the lights on. Check the lights on your vehicle by turning them on, and walking around the vehicle. You will check the headlights, taillights, and the brights that way. You will also want to turn on the blinkers and flashers to ensure those are working correctly. If a fuse is out, you may notice a blinker is not working. Make sure to schedule an appointment with us so we can inspect it for you. This entry was posted in Headlights, Maintenance, Safe Driving Tips, Tail Lights. Bookmark the permalink.